Regenerative and organic practices to improve soil and plant health are examples of good stewardship practices. Good stewardship of human resources include fair wages along with safe and just working conditions. Community-based food systems that support local farms and businesses associated with them are a pathway to engaging in the triple bottom-line benefits that are attentive to people, profits, and the planet. 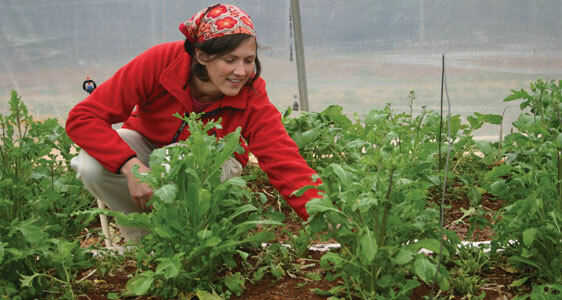 The practice of sustainable agriculture is a not only a career, but a lifestyle choice. Why a degree in Sustainable Agriculture? Practical solutions are available as an antidote to some of the biggest challenges of our time related to human and environmental health. Central Carolina Community College's Sustainable Agriculture Program has been training new farmers and local food system entrepreneurs in those practical solutions for 15 years. The applied science and business-based curriculum gives students a strong foundation in understanding the systems essential to a sustainable farm business. The on-campus, certified organic farm serves as a "living laboratory" where students can implement what they have learned in the classroom and enhance technical skills needed for successful farm operations. Integrated into the campus and the Pittsboro community, the student farm operates year-round, providing students with the opportunity to participate in and be prepared for the real-time challenges and rewards of organic food production. Who earns a degree in Sustainable Agriculture? As many other rewarding professions, sustainable agriculture is both physically and mentally challenging. We grow healthy, nutrient dense food outdoors, in the soil. The Piedmont NC climate allows for year-round food production, and local year-round markets expect it. Students of sustainable agriculture need to be prepared for the future in technical and technological skill sets, to be able to think critically and creatively to solve real world problems, and to recognize the need for good communication and record-keeping skills. An AAS in Sustainable Agriculture prepares students for work in a variety of food and sustainability fields, including farm management, advocacy and education, work in wholesale and retail produce, as well as the option to transfer to university* agroecology and sustainability programs. History: The Sustainable Farming Program at Central Carolina Community College grew out of a desire to address the needs of the farm community in Chatham County and the surrounding Piedmont region of NC. Initiated by local growers in 1996, the program quickly formed into a one-of-a-kind collaboration of farmers, community members, Central Carolina Community College, NC Cooperative Extension Service, Carolina Farm Stewardship Association, American Livestock Breeds Conservancy, R.E.A.L. Enterprises, NC A&T University and NC State University. The Program: The program takes a unique approach to instruction by using successful farmers as the main instructors. The classes are hands on with field trips to local farms and related businesses and are scheduled to accommodate the working student. The Land Lab has been developed as a research and demonstration facility for sustainable agriculture practices, as well as an outdoor classroom for hands-on instruction in horticulture and other agricultural disciplines. Students have the opportunity to take courses in a variety of subjects including Medicinal Herbs, Organic Vegetable Production, Sustainable Cut Flower production and Sustainable Poultry Production, as well as Biofuels, alternative energy and sustainable building. CCCC also offers an associate of applied science degree in sustainable agriculture, view degree and certificate options by clicking the curriculum programs tab. Recognize the characteristics of sustainable systems, and understand some of the challenges to sustainability in our present system of agriculture. Identify those crops which are suitable for organic production in the Southeast and be able to outline a management plan from start-up to market. Apply critical and creative thinking skills in farm management issues. Select appropriate breeds for farm needs and demonstrate an understanding of the role of livestock in a sustainable production system. Select, create and maintain the appropriate technology and structures needed for a successful, small-scale farming operation. Write a business plan for a current or future farm business that includes such details as whole farm and enterprise budgets as well as marketing strategies appropriate to skill level and farm scale. Create and present a written marketing plan appropriate for sustainable, organic production in the Southeast. Summarize the challenges to sustainability in our present system of agriculture orally and in writing. Create and maintain an appropriate computational/accounting plan utilizing technology for enterprise management and other record keeping requirements for a sustainable farm or agricultural business.